4. Enjoy ski / snowboard and snow sled at once! ※ You can rent out helmets / goggles/ protections / gloves at rental shop. This product is the most inexpensive and most valuable Winter ski / snowboard product. Once you read the product information thoroughly, you can have free ski / snowboard time without a professional guide! Since there are no lessons and no guides, you can issue tickets, ride, and rest when you want to, we strongly recommend it to those who don't want to follow the schedule. 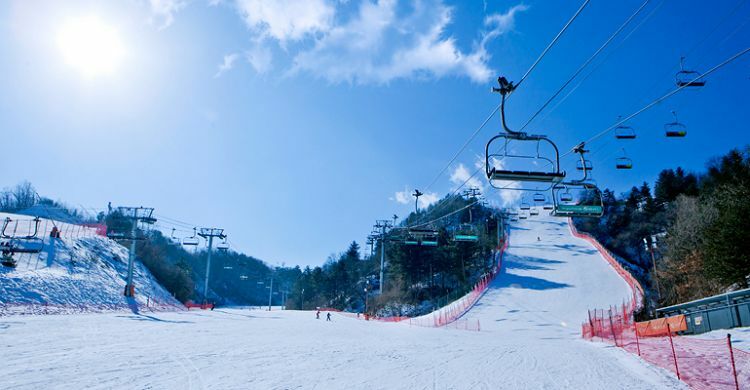 Elysian Gangchon Ski Resort is located just 1 hour away from Seoul is an accessible ski resort. Optimized for foreign visitors, the resort offers a 6 passenger express lift and runs by premium ticket reservation system that there are no waiting lines. • Enjoy a comfortable tour with non-stop service for immediate receipt at the rental equipment window. • There are Korea's first foreign-only ski schools. • Enjoy the beautiful snow scenery! • Snow Sled customized for kids is also equipped. ※ If you don’t see any staff from Sky Tour, please search for the bus placed 200m radius away from the subway exit! ※ Must confirm your voucher with the guide and board on. - You must receive Lift Ticket & Equipment Rental Ticket. - You must get off at Challenge House, where Seoul Pass Ticket Office is located! - Present email voucher / mobile voucher and receive an actual ticket at Ski House. - Ski House is about 10 minutes walk from Challenge House. - If you want to go snow sledding after skiing, please rent out ski equipment at Challenge House and ski first, then return all the equipment and go to Ski House and receive the snow sled ticket. 1. You have to make a reservation by 17:00 a day before the tour. 2. Changing the date or meeting point after 17:00 a day before the tour is not allowed. Please choose the date or meeting point carefully. 3. After the issue of Lift Ticket, you can ride on the lift for 8 hours, and under any circumstances, cancel or change of ticket cannot be made. 4. Please ride on the correct shuttle bus at the meeting point on reservation date. 5. Shuttle Bus will not wait for the latecomers. Make sure to arrive 10 minutes before the meeting time on the day of reservation. 6. There is no way to get on the missed bus, under any circumstances. Be sure to check the shuttle bus carefully, get confirmed your name and pass with the staff and get on the bus. 7. The guide on the bus is for the different tour product. You can ask for simple questions, but be sure to know that the guide is for a different tour. This product does not include a guide. 4. Check the shuttle bus at the meeting point on reservation date, Present mobile voucher or email voucher, and Board on the bus. 5. If you want to rent out helmet / goggles / protections / gloves at rental shops near ski resort. 6. Present your name and voucher at Challenge House. 7. Receive Lift Ticket & Equipment Rental Ticket. 8. Rent out ski / snowboard equipment at Challenge House. 9. Customers who reserved Snow Sled included package should present voucher at Ski House, snow sled ticket office. 10. After receiving the equipment, put on equipment on the chair in front of the locker. Q. I want to rent gloves and goggles. What should I do? A. Customers who want to rent out a helmet / goggles / protections / gloves should inform the guide on the bus when boarding on the bus. The guide will help you rent out equipment at rental shops near ski resort. Q. Where can I ask about tour information? A. You can ask for simple questions, such as the location of the resort, to the guide on the bus. However, the guide is for the different tour product, which has different lines of flow.